The Chicago actors Barbara Robertson and Gene Weygandt are rejoining the cast of “Wicked” when the touring production of show arrives in Chicago Cadillac Palace Theatre later this fall for its 8-week reprise engagement. 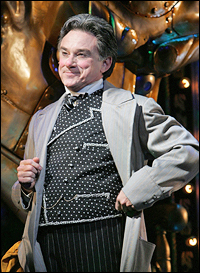 Weygandt, who plays the Wizard, joins the cast in Boston this month and will stay with the show through the end of the Chicago run. Robertson, who plays Madame Morrible, will just be in the show for the Chicago engagement. “It’ll be a homecoming,” said producer David Stone on Wednesday morning. The lead roles in the tour are played by Jackie Burns (Elphaba) and Chandra Lee Schwartz (Glinda). “Wicked” arrives at the Cadillac Palace Theatre on Dec. 1 and is slated to run through Jan. 23. Tickets go on sale Sept. 15; $30-$100. Buy Chicago Wicked Tickets before they go on sale. Wicked playing at Orpheum Theatre now through September 19. Back by “Popular” demand. Entertainment Weekly calls Wicked “the best musical of the decade,” and when it played Minneapolis in 2006 and 2008, it broke box office records and sold out in record time. Winner of 35 major awards, including a Grammy and three Tony Awards, Wicked is Broadway’s biggest blockbuster, a cultural phenomenon and was just named “the defining musical of the decade” by The New York Times. Orpheum Theatre is located at 910 Hennepin Ave., West Minneapolis, MN 55403. From here Wicked is moving to Madison, WI, playing at Overture Center Madison from September 22 to October 10, 2010.